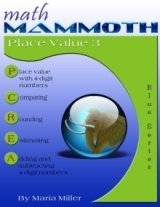 Math Mammoth Place Value 3 covers 4-digit numbers (numbers with thousands), and adding and subtracting them. We also study rounding and estimating, which are very important skills for everyday life. First, students learn 4-digit numbers, place value—breaking numbers such as 3,498 into thousands, hundreds, tens, and ones—and comparing 4-digit numbers. Next, they practice some mental addition and subtraction with 4-digit numbers. The lesson stresses the similarities between adding and subtracting 4- digit numbers and adding and subtracting smaller numbers. Practicing mental math also helps to build number sense. We also study regrouping in addition and subtraction, using 4-digit numbers. The last major topics in this chapter are rounding numbers to the nearest hundred and estimating. Students also get to do some more word problems. 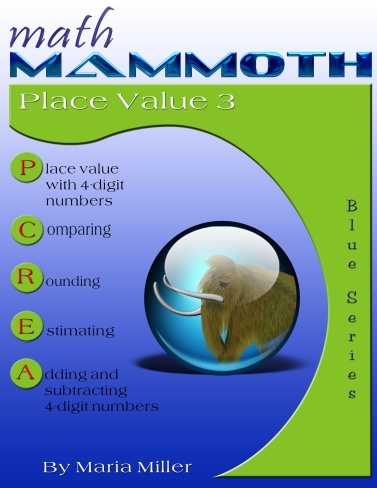 Math Mammoth Place Value 4—a worktext about thousands, ten thousands, and hundred thousands, addition and subtraction with those numbers, comparing, and the idea of multiples (grades 4-5).